Whereas in SimCity 2000 you could edit the terrain before beginning a game, with SimCity 3000 you cannot, but you CAN load your own custom bitmap from within the game. This feature is not really a main part of the game (should be), but instead is used kind of as a cheat. To load the terrain, you must open the cheat dialogue box, by holding [Ctrl], [Shift], [Alt] and [C] keys down. The cheat window should come up in the top left corner of the screen. You then enter "load terrain (path)", with the "path" being the path to the bitmap file. 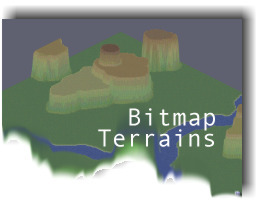 So, the bitmap terrains must be 65x65, 129x129 etc. to load properly. Start the game with the size you want the file to be loaded in, because if you start a game with a smaller or larger sized map than the one you are loading, the loaded file will not turn out correctly. You COULD use a program such as Microsoft Paint for Windows to edit a terrain to be saved as a bitmap file, BUT, it will either take you a year, or you will get a terrain that has 3000 meter 90 degree cliffs. Programs to use would be those suited for image editing, that will give you options to shade and smoothing etc. I use Corel Photo-Paint 8, and find it to be excellent for this task. Other good programs are Microsoft Picture It, Adobe PhotoDeluxe, Corel Photo House, or Adobe Photoshop (which I've heard to be for very advanced users only).